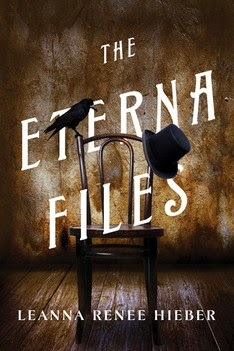 The Eterna Files is a Gaslamp Fantasy set in the late 1800’s in London and New York City. It centers on Eterna, a secret organization founded by Mary Todd Lincoln after the death of her husband, to seek out the cure for mortality. But tragedy strikes Eterna and Clara Templeton and the remaining members of the team must find out what happened. Meanwhile across the pond, Queen Victoria, who is also mourning the death of a husband, catches wind of America’s spiritual endeavors and creates Omega, her own version of Eterna. But suddenly the Omega scientists go missing and metropolitan policeman Harold Spire is recruited to solve the case. This book has a lot of potential. The story is fun and the characters are interesting, each with their own special spiritual/clairvoyant talent to bring to the table. Unfortunately though, The Eterna Files is way too much tell me and not enough show me, and this technical flaw is hard to ignore. It is especially evident in the first two-thirds when the story and characters are being developed. There is really nothing for the reader to infer and we are constantly told exactly what the characters’ thoughts and motives are. Moriel is the only one who doesn't suffer from this transparency, probably because we only get a small taste of him and there isn't any room for extraneous musing. But as the action picks up in the latter portion of the book this overuse of 'tell me’ subsides greatly and Hieber's writing really begins to shine. I was finally drawn in and engrossed as things started to unfold, and was eager to find out what would happen next. But The Eterna Files feels like half of a story. At around 300 pages, it ends just as it was starting to get good, with no real resolution at all. There is no indication that is the first in a series, but I did find an interview where Hieber say she is “hard at work on the sequel”...which is good, I guess. Honestly though, I'd prefer that this book was a little longer to allow for a better, more climactic ending, rather than having to wait around for a potential sequel.